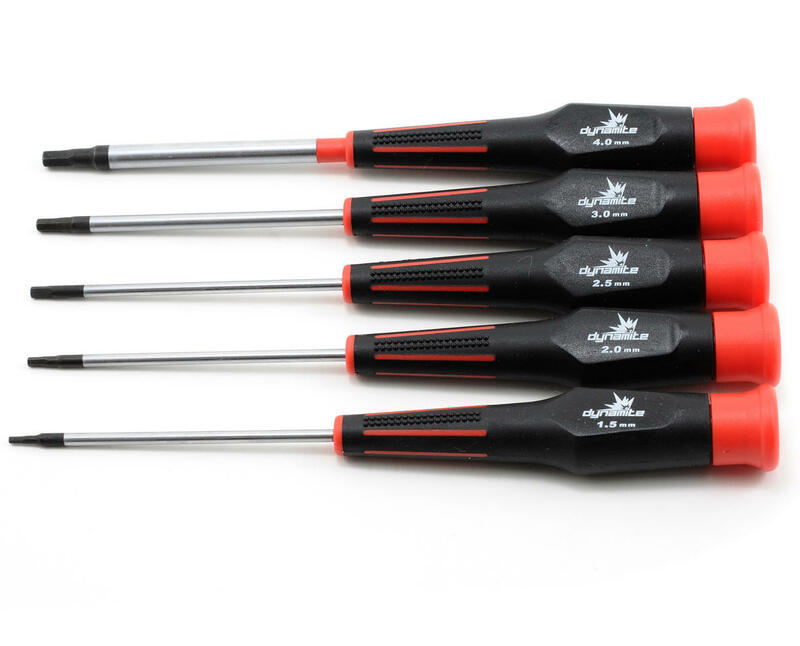 This is a set of five Dynamite rubber coated handle metric Hex Drivers. This tool set is an excellent choice when you need a set of affordable tools, that work as well as tools that cost twice the price. I've had this set for over a year now, and honestly it's money well spent. Only now is the 2mm rounding out that I will have to get it replaced, but at the individual price of $2.79 it's more than worth it. I looked around at everything thinking that more money = better quality and bought this set simply to hold me over until I had money to spend on a "nice" set. After seeing how well these have held up, I can honestly say that it's a well made product. Sure it will strip if you're a gorilla and tighten the little screws so much that they becomes impossible to get loose, but if you know anything about wrenching (I've worked on many cars in my life), you'll know NEVER to over tighten. Same goes with these RC cars. I bought two sets and in both the 1.5mm driver does not fit anything. The head is too big. Save yourself the time and aggravation and buy the machined set DYN2904. I actually bought this set back in 2003 and still use it today. It's getting a bit worn and finally time to replace it but it's built more cars than I can remember and I am pretty sure I paid 11 bucks for it back then. Considering I got 14 years of use I'd say it's a pretty good deal. Garbage! Tips strip easily. Buy the red handle dynamite or MIP tools. I use the smallest size 1.5mm more than any other size. After a year of moderate use the 1.5mm is still okay. Seems excellent for the price. Lower priced options like this enable me to stay in the hobby. This set is an OK set for starting out like me and on a budget. It will get the job done and for the price, it's not too bad. However, there does come a time when one starts looking for something that's better and more durable. I bought this set a few months back. The larger hex's are fine, but the 1.5mm, 2.0mm & 2.5mm are stripping already. I like my bolts tight, and these just haven't lasted. They are cheap though. Guess old addage - you get what you pay for. Great drivers for the price. I bought the metric and standard sets. They work great and fit the screws very good. I have wore out my 2 and 2.5 mm drivers in about 8 months, but I probably used them more than most people will in a lifetime, and at $13 for a set they are well worth it. I will be replacing them with another set soon. I also put a pair of pliers on my 3mm driver frequently to loosen my motor mounts on my 1/8 scale cars and have not broken it yet, or stripped a screw. I know there are higher quality drivers out there, but for the $3.00 a piece it is to replace wore out ones I'll keep buying these. If you are looking for a good set of drivers that will last a while don't hesitate to buy these. Had the same experience with the hex drivers.....bought the nut drivers and they seemed good..
You get what you pay for with these and for that they arent a bad deal. however the longevity leaves me something to desire. for example ive just about destroyed the 2mm one in less than 5 months. my losi tool set ive had for almost 10 years, the tips still look new and have never stripped out a quality screw. if good tools are in your budget get good tools, these while good for awhile, simply dont stand the test of time. Very high quality metal products. I used the same set. Price acceptable. This thing needed.